This set of Tough Molecular Biology Questions and Answers focuses on “Regulation at the Level of Transcription Involves Several Steps”. 1. In case of transcription which is the rate limiting step? Explanation: When polymerase binds it spontaneously undergoes a transition to the open complex and initiates transcription. This gives a low level of constitutive expression called the basal level. Thus binding of RNA polymerase is the rate limiting step. Explanation: Operator is the repressor binding site. Promoter is the polymerase binding site. Terminator is the site for transcription termination. ORF is the open reading frame in the mRNA used by the ribosome for translation. Explanation: The activator uses one surface to bind to a site on the DNA near the promoter; with another surface, the activator simultaneously interacts with the RNA polymerase, bringing the enzyme close to the promoter. This mechanism is known as the recruitment of polymerase and is an example of cooperative binding of proteins to DNA. 4. The proteins of which of the following genes are regularly needed for cellular activity? Explanation: Housekeeping genes are those genes that are typically constitutive genes. They are generally required for the maintenance of basic cellular functions. They are thus expressed in all cells of an organism under normal conditions. 5. Which of the following are the products of constitutive gene? Explanation: The products of the constitutive genes are generally used all the time for different cellular processes. They include all metabolic, that is, catabolic and anabolic processes and production of structural elements of the cell. Thus they are synthesized continuously within the cell. 6. Which of the following is not an example of allosteric regulation? Explanation: When the nitrogenase product, ammonium, becomes available, the ADP ribosyltransferase covalently links to the ADP-ribose moiety to a specific arginine residue on nitrogenase switching-off nitrogenase activity. Thus as it involves covalent reaction and is not an example of allosteric regulation. Explanation: Operons are generally of varied lengths as the number of genes differs from operon to operon. They are able to bind to different proteins such as activators, repressors, polymerases, etc. their size does not depend on the genetic complexity of the eukaryotes and are generally not found in higher eukaryotes. 8. Which of the following are correct according to operons? Explanation: An operon is a functionating unit of genomic DNA containing a cluster of genes under the control of a single promoter. Thus the two ends of an operon are marked by the promoter and terminator on either side. As they are regulated by a single promoter, they work in coordination. 9. Choose the correct pair among the following. iii) The DNA sequence to which repressors binds – operator. 10. Which of the following is not present in the β-galactosidase structural gene and thus is not transcribed by the same promoter? Explanation: β-galactosidase structural gene consists of three genes, lac A, lac Z and lac Y. They synthesize β-galactoside transacetylase, β-galactosidase and β-galactoside permease respectively. Explanation: Catabolite repression allows bacteria to adapt quickly to a preference carbon and energy source first. As the primary source of carbon for bacteria is glucose, thus it takes up glucose even if other sugars are present in abundance. Explanation: The cAMP binds to catabolite activator protein to regulate the activity of the lac operon. This enables the formation of a cAMP-activator complex that turns on transcription after it binds near the promoter. 13. Tryptophan operon in E. coli is a repressible operon. Explanation: Tryptophan operon is a repressible negative regulated operon. Within the operon’s regulatory sequence, the operator is blocked by the repressor protein in the presence of tryptophan and is liberated in tryptophan’s absence. The process of attenuation complements this regulatory action. 14. Which of the following is true about tryptophan operon? Explanation: The tryptophan operon contains a gene trp R which synthesizes mRNA for a regulatory protein. This protein binds to tryptophan molecule and further interacts with the operator of the trp operon, thus effectively blocking transcription of the gene. 15. The expression of the tryptophan operon is independent of the availability of tryptophan in culture media. Explanation: The expression of the tryptophan operon is dependent of the availability of tryptophan in culture media. This type of regulatory process is termed as attenuation that is, the operator is blocked by the repressor protein in the presence of tryptophan and is liberated in the presence of tryptophan. 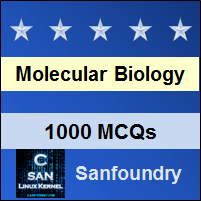 To practice Tough questions and answers on all areas of Molecular Biology, here is complete set of 1000+ Multiple Choice Questions and Answers.